The popular RCPS rebar carport saddle works as a cast-in-place or post-installed saddle for connecting posts to concrete. Now it has been redesigned with added features that offer greater installation flexibility and strength. Along with these design improvements, the RCPS is also available in a black powder coat for applications that call for a more finished look. Post bases do not provide adequate resistance to prevent members from rotating about the base and therefore are not recommended for non-top-supported installations (such as fences or unbraced carports). A one-page Canadian Limit States version of the technical bulletin discussing the structural properties of two different surface sides of columns made from structural composite lumber (SCL). Factored resistances have been increased 15% for seismic or wind loading with no further increase allowed; reduce where other loads govern. Structural composite lumber columns have sides that show either the wide face or the edges of the lumber strands/veneers. Values in the table reflect installation into the wide face (see T-C-SCLCLMCAN in Related Literature above for details). 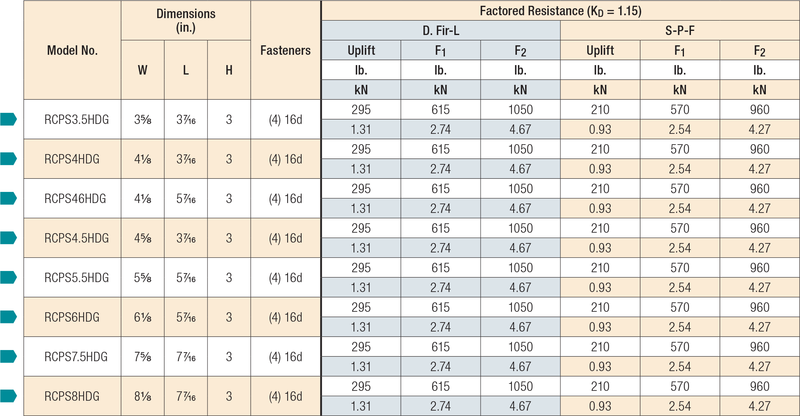 Factored resistances shown assume dry service condition (KSF = 1.00). Multiply table values by 0.67 under wet service conditions. Nails: 16d = 0.162" dia. x 3 1/2" long. See other nail sizes and information.